This is what we're famous for! Home made chowders and stews are served with crackers. This isn't food from a can or stock from a distributor. We cook from scratch with no additives or preservatives.Our chowders are brothy and thin but full of seafood! 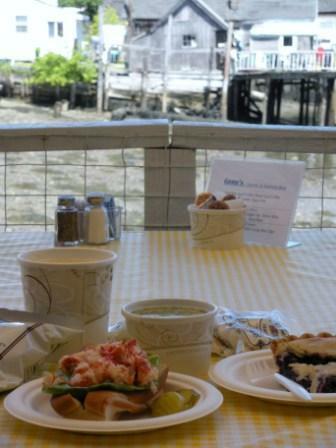 We offer a sample of our chowders, so please ask. A locally caught New England favorite! Fresh daily from local boats across from our deck! 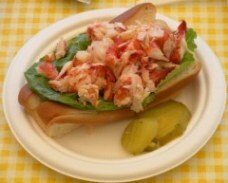 Jumbo Lobster Roll 5 oz. of Lobster Salad on a buttered toasted hot dog bun with chips and a pickle. Tossed Salad w/ Lobster 3 oz. of lobster meat tops a green salad of lettuce, tomato, cucumber, croutons and your choice of dressing. Lobster Salad Plate 3 oz. of Lobster Salad on a bed of lettuce, served with potato salad, tomato, cucumbers and crackers. 3 oz. of hand picked Maine Crab Salad on a toasted roll with chips and a pickle. Chicken Salad or Tuna Salad tops a salad of lettuce, tomato, cucumber, croutons and choice of dressing. Chicken Salad or Tuna Salad on a bed of lettuce, with potato salad, tomato, cucumbers and crackers.